The fungal species, Geosmithia pallida, was recovered from symptomatic plant tissues in association with the western oak bark beetle (WOBB) Pseudopityophthorus pubipennis (Figure 3, inset). WOBB appears to attack trees weakened by drought, disease, injuries, or other factors that may stress the tree. Pathogenicity tests on detached shoots showed that G. pallida is capable of causing disease to coast live oak seedlings and produced symptoms of foamy canker. Symptoms occurring on the trunk and primary branches include wet discoloration seeping through entry holes caused by the western oak bark beetle (P. pubipennis). 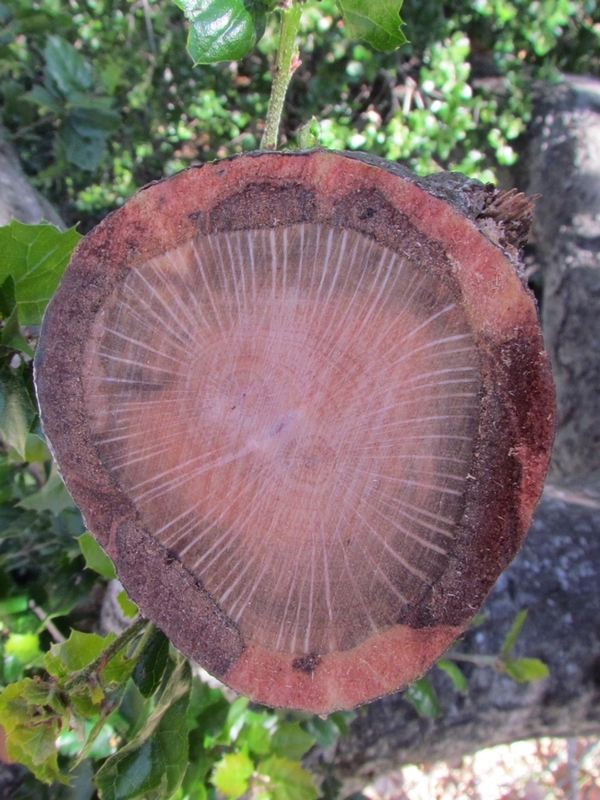 Peeling back of the outer bark reveals phloem necrosis surrounding the entry hole, and multiple entry holes may be observed on each tree (Figure 3). 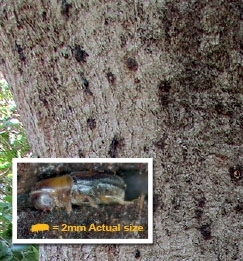 At the initial face of attack, a reddish sap may ooze from the entry hole, followed by a prolific foamy liquid, which may run as far as 2 feet down the trunk (Figure 4). Western oak bark beetle is a small beetle (about 2 mm long) that burrows through the bark, excavating shallow tunnels under the bark across the grain of the wood. Female beetles lay their eggs in the tunnels; the developing larvae tunnel at right angels to these, but mostly within the phloem (inner bark) close to the surface. Landscape professionals and homeowners should note that symptoms may be confused with those caused by fusarium dieback/polyphagous shot hole borer (PSHB). However, the size of the entry hole associated with foamy canker is smaller than that made by the PSHB. For information about PSHB and fusarium dieback, see http://eskalenlab.ucr.edu/avocado.html. Currently, no control methods are in place to control the fungus or the beetle. 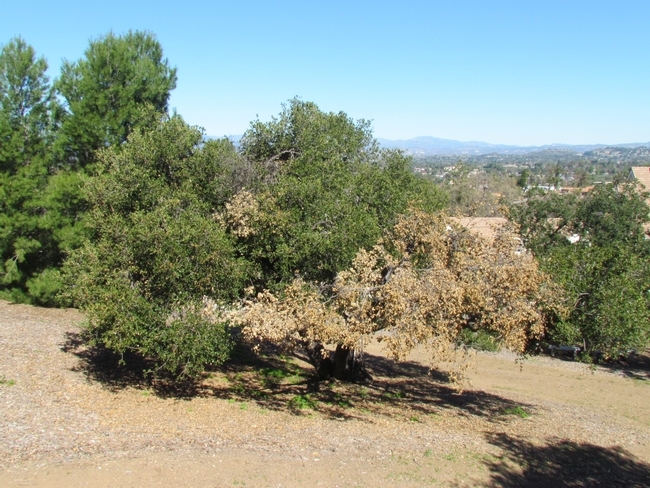 When the infection is at an advanced stage, the coast live oak tree dies. 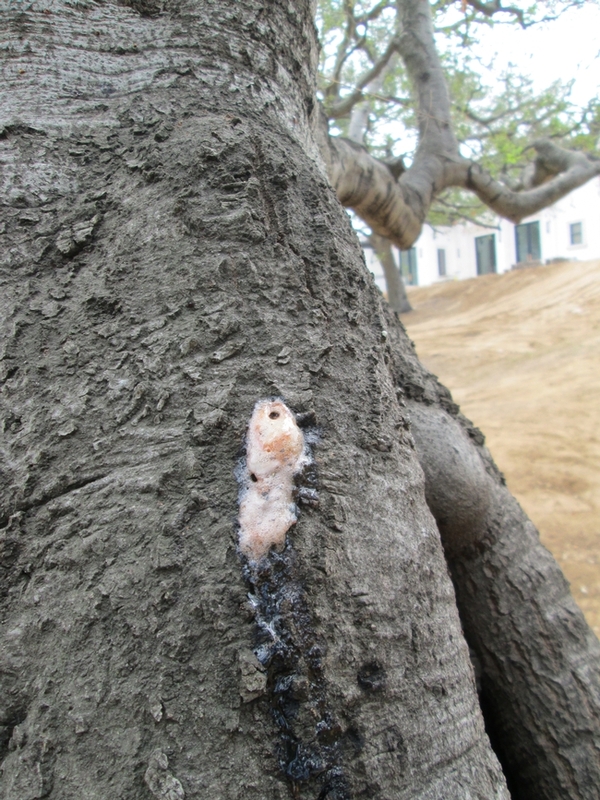 If you suspect that you have found these symptoms of the foamy canker on your coast live oak tree, please contact either your local University of California Cooperative Extension farm advisor, pest control advisor, county Ag Commissioner office, or Dr. Akif Eskalen at UC Riverside. For more information visit www.eskalenlab.ucr.edu.